The Fund aims to provide income with the opportunity for long-term capital growth primarily through investment in a portfolio of debt securities (e.g. bonds) which are issued by Chinese Borrowers. The Fund may hold debt securities issued in Mainland China, including, without limitation, the China Interbank Bond Market. All China approach which allocates between onshore and offshore Chinese government and corporate bonds offers opportunities across the cycle. With average A-rating1 and good diversification, the Fund currently offers an annualised dividend yield of 5.5% (A Inc-3 USD)2 (dividend yield is not guaranteed, dividends may be paid out of the Fund’s capital). Chinese bonds have low correlation versus other asset classes which could help diversify overall portfolio returns. China is the world’s second largest economy and the third largest bond market. As it opens up the market to international investors, we believe that Chinese bonds will feature increasingly as a core fixed income holding. Chinese government bonds offer better valuation versus most developed marketswith generally lower yield volatility. 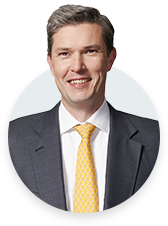 Allocating to Chinese fixed income can help diversify overall portfolio returns because China’s interest rate movements are predominantly determined by domestic factors. 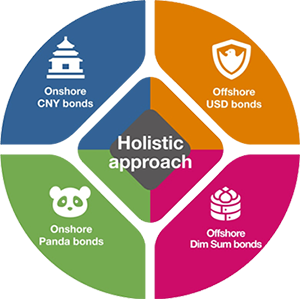 A holistic approach which includes onshore CNY bonds, offshore USD bonds and Dim Sum bonds maximises the investment universe to achieve attractive yield and credit quality. We believe a best-ideas China-centric fixed income strategy can help identify investment opportunities across the market cycle. A broad investment mandate allows active managers to unlock relative value opportunities between different markets. The portfolio is predominantly investment grade with an average rating of A1. Portolio duration of 3.8 years2 and net RMB exposure of 100%2. Attractive monthly dividend yield of 5.1% (A Inc-3 USD) currently2 (Aims to make dividend payments on a monthly basis, dividend yield is not guaranteed, dividends may be paid out of the Fund’s capital). 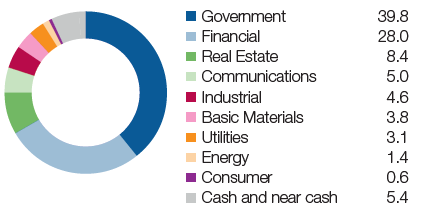 Well diversified portfolio covering different sectors including government bonds. Investors should note that lower volatility does not necessarily mean lower risk. 1 Source: ratings based on Moody’s, S&P and/or Fitch credit ratings, Investec Asset Management calculation, 30.09.18. The top credit rating is ‘AAA’. The lowest rating to be considere d ‘investment grade’ is ‘BBB’. Below ‘BBB’, bonds are termed ‘subinvestment grade’ or ‘high yield’. 2 Source: Investec Asset Management, as at 30.09.18. Annualised dividend yield = Distribution per share/Record date NAV)*dividend frequency. Based on A Inc-3 USD share class which aims to make dividend payments to investors on amonthly basis. Warning: Please note that a positive distribution yield does not imply a positive return. This document is for information and general circulation only. It does not have regard to the specific investment objectives, financial situation and particular needs of any specific person who may receive it. The value of this investment, and any income generated from it, will be affected by changes in interest rates, general market conditions and other political, social and economic developments, as well as by specific matters relating to the assets in which it invests. Past performance figures shown are not indicative of future performance. The Fund’s investment objective will not necessarily be achieved and investors are not certain to make profits; losses may be made. The Fund may use or invest in financial derivatives. Please note that a positive annualised yield does not imply a positive return. Dividend is not guaranteed. Certain Share Classes may pay dividend gross of expenses subject to the Board of Directors’ discretion. The value of the shares in the fund and the income accruing to the shares, if any, may fall or rise. Potential investor should read the details of the Prospectus before deciding to subscribe for or purchase the Fund. Investment involves risk. Please refer to the Singapore Offering Documents (including the risk factors set out therein) and the relevant Product Highlights Sheet for details which are available at your bank and financial advisor. For more information, please contact your bank and financial advisor. Investors may wish to seek advice from a financial advisor before making a commitment to purchase units of the Fund. In the event that an investor chooses not to seek advice from a financial advisor, he/she should consider carefully whether the Fund in question is suitable for him/her. Informational sources are considered reliable but you should conduct your own verification of information contained herein. Any opinions stated are honestly held but are not guaranteed and should not be relied upon. It does not constitute investment advice, or an offer to sell, or a solicitation of an offer to buy any security, investment product orservice. The portfolio may change significantly over a short period of time. The Fund is a sub-fund of the Investec Global Strategy Fund, which is a UCITS organised as a Societed Investissement a Capital Variable under the law of Luxembourg. This document should not be distributed to private customers who are resident in countries where the Fund is not registered for sale or in any other circumstances where its distribution is not authorised or is unlawful. Please visit www.investecassetmanagement.com/registrations to check registrations by country. This document has not been reviewed by the Monetary Authority of Singapore. 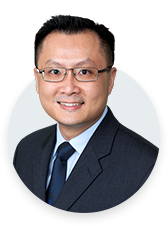 Issued by Investec Asset Management Singapore Pte Limited (Co. Reg. No. 201220398M).